Artwork of Pooka from Dig Dug: Digging Strike. Pookas (プーカ, Pooka), are enemies from the Pac-Man universe, originating from the Dig Dug universe. Originally, Pookas were enemies in the game Dig Dug, but later became recurring characters in Pac-Man's games. A Pooka made its debut in a Pac-Man title in Pac-Man World, and Pookas first served as enemies in Pac-Man World 2. Pac-Man fighting a Pooka in Smash Run. Pookas appear as enemies in Smash Run in Super Smash Bros. for Nintendo 3DS. They attack by ambushing fighters from underground or through walls, though their goggles are visible even when they are inside the terrain. When they attack, they do not deal any damage but are capable of disrupting fighters by knocking them over. When attacked they inflate until they pop, damaging nearby enemies. If they are not attacked while they are in an inflated state, they will gradually deflate until they return to normal. A Pooka sprite, as it appears in Pac-Man's Namco Roulette taunt, on the top. A Pooka also appears in its original sprite form as one of the characters Pac-Man can summon as part of his Namco Roulette taunt. The Pooka trophy is exclusive to Super Smash Bros. for Nintendo 3DS. Pooka trophy in for 3DS. These little monsters from the Dig Dug series like to jump around and throw themselves into people. They'll burrow through the ground to protect themselves from attacks as they approach. If you do manage to hit one, it'll puff up, growing with each attack until it explodes. Try hitting enemies with its explosion! 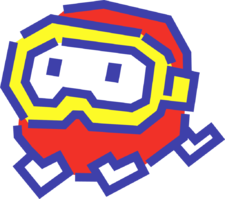 These little monsters from the Dig Dug series like to jump around and throw themselves into people. They'll burrow through the ground to protect themselves from attacks while they approach you. If you do manage to hit one, it'll puff up, then eventually explode! Try using the blast to damage other enemies. Though almost never seen, Pooka do have a tumbling animation built into them. They would need to be hit by an extremely weak attack such as Luigi's down taunt, Cloud's Finishing Touch or a cannonball by another small enemy to tumble, and not inflate. Despite Pookas becoming part of the Pac-Man series, they are placed in the Other section of the trophy gallery. This is very likely due to their Dig Dug origins. This page was last edited on April 20, 2019, at 01:46.